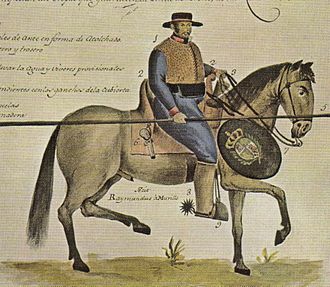 Spanish Formosa (Spanish: Formosa Española) was a small Spanish colony established in the northern tip of the island known to Europeans at the time as Formosa (now Taiwan) from 1626 to 1642. It was conquered by the Dutch in the Eighty Years War. The Portuguese were the first Europeans to reach the island off the southern coast of China in 1544, and named it Formosa (Portuguese for "beautiful") due to the beautiful landscape as seen from the sea. The Spanish colony was meant to protect the regional trade with the Philippines from interference by the Dutch base in the south of the island. The colony was short-lived due to the unwillingness of Spanish colonial authorities in Manila to commit more men and materiel to its defense. After seventeen years, the last fortress of the Spanish was besieged by Dutch forces and eventually fell, giving the Dutch control over much of the island. 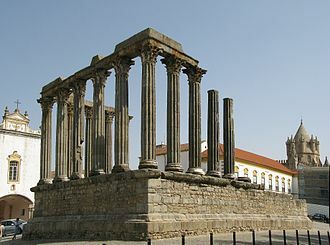 As a result of the personal union of the Spanish and Portuguese crowns in 1580, Spanish Habsburg monarchs ruled Portugal and its colonies as the King of Portugal. The Dutch of the Seventeen Provinces as well as their allies England and France became enemies of both Portugal and Spain. The Spanish Habsburgs cut the Dutch rebels off from the spice markets in Lisbon, making it necessary for the Dutch to send their own expeditions to the sources of these commodities to take control of the much desired spice trade in the East Indies. 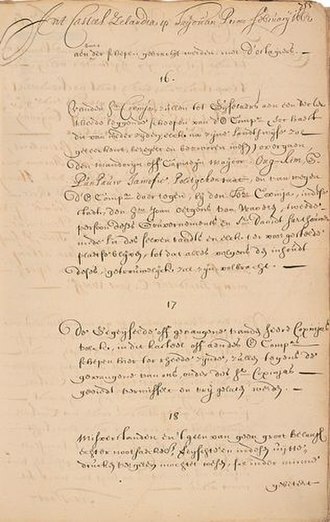 The Dutch colonization of Formosa was part of a campaign designed to seize all the possessions of the Spanish Habsburgs in Asia, including the Philippines. 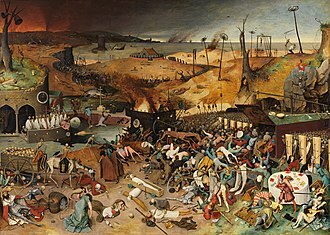 The Dutch began to take a string of often undermanned coastal fortresses that comprised the Habsburg's Portuguese African and Asian possessions, taking full advantage of the many enemies and pirates that the Habsburgs had to defend their global empire against. The settlements were isolated, difficult to reinforce if attacked, and prone to being picked off one by one, but nevertheless, the Dutch only enjoyed mixed success in its attempts to take them. Pursuing their quest for alternative routes to Asia for trade, the first Dutch squadron to reach the Philippines on 14 December 1600 was led by Olivier van Noort. 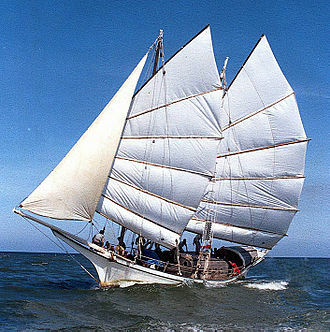 The Dutch sought to dominate the commercial sea trade in Southeast Asia, even engaging in privateering. They disrupted trade by harassing the coasts of Manila Bay and its environs, and preyed on sampans and junks from China and Japan trading at Manila. 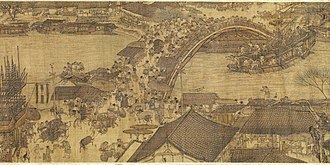 In the context of this competition for trade, the Dutch established a colony at Tayouan, present-day Anping, in the south of Formosa. 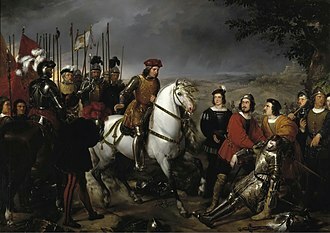 From there the Dutch were able to threaten Spain's trade in the region. As a counter to this threat, the Spanish colonial authorities in Manila decided to establish their own colony in the north of the island. Landing at Cape Santiago in the north-east of Formosa but finding it unsuitable for defensive purposes, the Spanish continued westwards along the coast until they arrived at Keelung. A deep and well-protected harbour plus a small island in the mouth of the harbour made it the ideal spot to build the first settlement, which they named Santissima Trinidad. Forts were built, both on the island and in the harbour itself. In 1629 the Spanish erected a second base, centered on Fort San Domingo, in Tamsui. 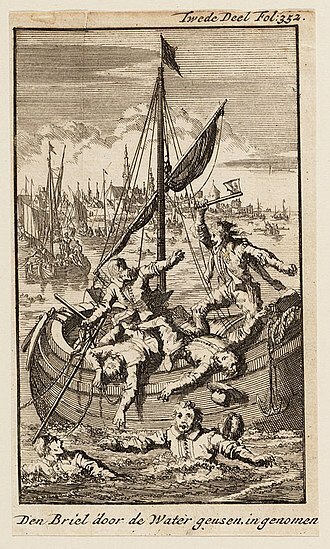 In 1641, the Spanish colony in the north had become such an irritant to the Dutch in the south that it was decided to take northern Formosa by force. In courteous terms, the Dutch Governor Paulus Traudenius informed the Spanish governor of their intentions. 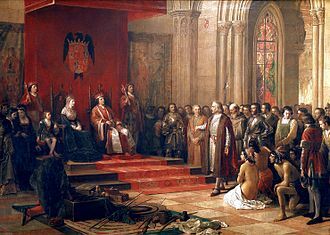 I have the honor to communicate to you that I have received the command of a considerable naval and military force with the view of making me master by civil means or otherwise of the fortress Santissima Trinidad in the isle of Ke-lung of which your Excellency is the Governor. In accordance with the usages of Christian nations to make known their intentions before commencing hostilities, I now summon your Excellency to surrender. If your Excellency is disposed to lend an ear to the terms of capitulation which we offer and make delivery to me of the fortress of Santissima Trinidad and other citadels, your Excellency and your troops will be treated in good faith according to the usages and customs of war, but if your Excellency feigns to be deaf to this command there will be no other remedy than recourse to arms. I hope that your Excellency will give careful consideration to the contents of this letter and avoid the useless effusion of blood, and I trust that without delay and in a few words you will make known to me your intentions. The Spanish governor was not inclined to give in so easily and replied in kind. Sir; I have duly received your communication of August 26th, and in response I have the honor to point out to you that as becomes a good Christian who recalls the oath he has made before his king, I cannot and will not surrender the forts demanded by your Excellency, as I and my garrison have determined to defend them. I am accustomed to find myself before great armies, and I have engaged in numerous battles in Flanders as well as other countries, and so I beg of you not to take the trouble of writing me further letters of like tenor. May each one defend himself as best he can. We are Spanish Christians and God in whom we trust is our protector. May the Lord have mercy on you. Written in our principal fortress San Salvador the 6th of September 1641. Subsequently, the Dutch launched an assault on the northern regions held by the Spanish, but the positions were well-defended and the attacking troops were not able to breach the walls of the fortresses. They returned, thwarted and humiliated, to the Dutch base at Fort Zeelandia. In August 1642, The Dutch returned to Keelung with four large ships, several smaller ships, and approximately 369 Dutch soldiers. 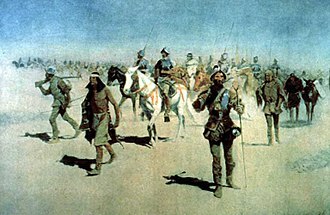 A combination of Spaniards, aboriginals, and Pampangos from the Philippines held off the Dutch for six days. They eventually surrendered and were returned to Manila defeated, and giving up their flags and what little artillery remained with them. Sebastián Hurtado de Corcuera, governor of the Philippines, was blamed for the loss of Formosa and was eventually tried in court for his actions. Upon conviction, he was imprisoned for five years in the Philippines. Historians since Corcuera's time have chastised him for the loss of the settlement in Formosa but other factors, such as the continuing rise of the Dutch Empire in Southeast Asia, and financial troubles within the over-stretched empire, were also contributing factors. 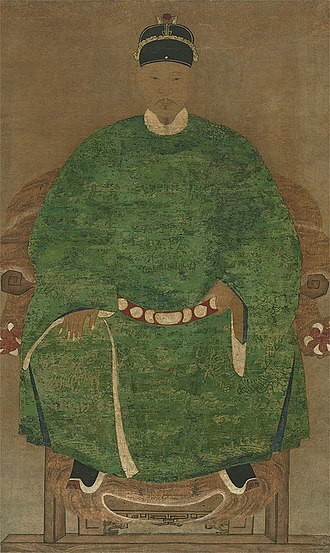 ^ Sujuan, Zhan (2012-05-22). "The Taiwan Encyclopedia". Council for Cultural Affairs. Retrieved 2012-05-22. ^ Boxer, C. R. (1969). The Portuguese seaborne empire 1415-1825. London: Hutchinson. p. 23. ISBN 0090979400. ^ Davidson (1903), p. 19. ^ Davidson (1903), p. 20. ^ a b Davidson (1903), p. 21. ^ a b c Andrade, Tonio (2005). How Taiwan Became Chinese: Dutch, Spanish and Han Colonization in the Seventeenth Century. Columbia University Press. ^ Jose Eugenio Barrio (2007). "An Overview of the Spaniards in Taiwan" (pdf). University of Taiwan Foreign Languages in Literature. University of Taiwan. Retrieved 2012-05-16. The Republic was proclaimed on 23 May 1895 and extinguished on 21 October, when the Republican capital Tainan was taken over by the Japanese. In 1894, China and Japan went to war, in a few short months the Japanese defeated Chinas Beiyang fleet, routed the Chinese armies in Manchuria, and captured Port Arthur and Weihaiwei. Although nearly all the fighting took place in northern China, Japan had important territorial ambitions in southern China. As the war approached its end, the Japanese took steps to ensure that Taiwan would be ceded to Japan under the peace treaty. In March 1895 peace negotiations between Japan and China opened in the Japanese city of Shimonoseki, although hostilities in northern China were suspended during these negotiations and the Pescadores were specifically excluded from the scope of the armistice. This exclusion allowed the Japanese to mount an operation against the Pescadores Islands in March 1895 without imperilling the negotiations. 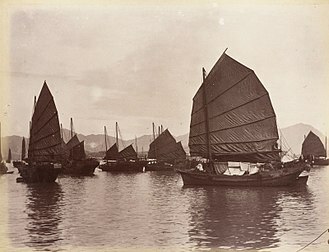 The Pescadores, lying midway between mainland China and Taiwan, were the key to an occupation of Taiwan. In a swift campaign in the last week of March the Japanese captured the islands and this brisk fait accompli influenced the peace negotiations, and the ensuing Treaty of Shimonoseki, concluded on 17 April 1895, duly provided for the cession by China of Taiwan to Japan. On 10 May, Admiral Kabayama Sukenori was appointed the first Japanese governor-general of Taiwan, when the news of the treatys contents reached Taiwan, a number of notables from central Taiwan led by Qiu Fengjia decided to resist the transfer of Taiwan to Japanese rule. On 23 May, in Taipei, these men declared independence, proclaiming the establishment of a free, Chiu was appointed Grand Commander of Militia, with the power to raise local militia units throughout the island to resist the Japanese. His job would be to sell the Republic abroad, davidsons version reads as follows, Official Declaration of Independence of the Republic of Formosa. The Japanese have affronted China by annexing our territory of Formosa, and the supplications of us and we now learn that the Japanese slaves are about to arrive. Tamsui is a sea-side district in New Taipei, Taiwan. It is named after the Tamsui River, the name means fresh water, the town is popular as a site for viewing the sun setting into the Taiwan Strait. Though modest in size, it has a role in Taiwanese culture. Originally settled by the Ketagalan aborigines, the location was called Hoba, Hoba was loaned into Taiwanese Hokkien as Hobe. Historical works in English have referred to the place as Hobe, Hobé, the Spanish arrived in the 17th century and called this place Casidor and the Tamsui River Kimalon. Dutch records have used the placenames Tamsuy and Tampsui to refer to this area, the first variant Tamsui is consistent with Hokkien literary readings, and is equal to the Church Romanization of an older pronunciation minus tone markings and hyphen. The variant Tan-sui, with exception of the hyphen, is consistent with the romanization of Japanese, the first variant was apparently already well-known circa 1900, and features prominently in two English-language maps of the same era. Furthermore, at time, the term Tamsui was used in a most liberal way, it may mean the harbor, the river, the village of Hobe, Twatutia, or Banka. From 1950 until the 2010 creation of New Taipei City, Tamsui was officially Tamsui urban township in the former Taipei County, the spelling Danshui, formerly used officially by the Taiwan government, Taipei Metro, and other sources, is based on the Mandarin pronunciation. Meanwhile, the name Tamsui is based on the Taiwanese pronunciation, having long used Tamsui as the official English name, the local government of the district informed the national government in 2011 that Tamsui rather than Danshui should be used in English. The Spanish arrived in the area of Tamsui in the 17th century, in the fall of 1629, the Spanish established the first major non-aboriginal settlement comprising the town and mission of Santo Domingo. 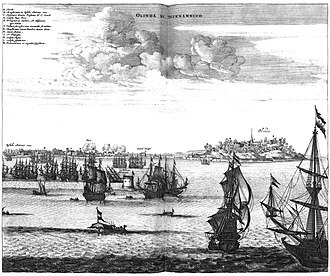 In 1641, the Spanish were expelled from Taiwan by the Dutch, the Spanish had already abandoned their settlement in Tamsui in 1638 and the Dutch built a new fort which they named Fort Anthonio. 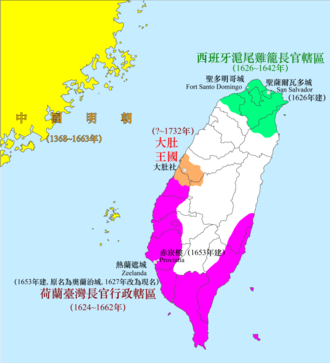 Taiwan under Qing rule refers to the rule of the Qing dynasty over Formosa and the Pescadores from 1683 to 1895. The Qing court sent an army led by general Shi Lang and it was governed as Taiwan Prefecture of Fujian Province until the declaration of Fujian-Taiwan Province in 1887. Qing rule over Taiwan ended when Taiwan was ceded to Japan by the Treaty of Shimonoseki in 1895, in 1683 following the Battle of Penghu, Qing troops landed in Taiwan. The Kangxi Emperor of the Qing dynasty annexed Taiwan to remove any threat to his dynasty from remaining resistance forces on the island, Qing authorities did not want to develop Taiwan over aggressively as this might have encouraged potential resistances force to build a base there. Accordingly, the early Qing dynasty initially ruled Taiwan passively as part of Fujian, in 1721, a Hakka-Fujianese rebellion led by Zhu Yigui captured Taiwan-fu and briefly established a government reminiscent of the Ming dynasty. In the immediate aftermath of Zhu Yigui rebellion, the desire to open up new land for cultivation saw government encouraging the expansion of Han Chinese migration to areas of the island. For instance, the population in the Tamsui area had grown to the point where the government needed a centre there. The government tried to build a centre with local aboriginal corvée labor, aboriginal groups split their loyalties —most joined the uprising, some remained loyal to the Qing, perhaps because they had pre-existing feuds with the other groups. The aboriginal revolt was put down within a few months with the arrival of additional troops, the Lin Shuangwen rebellion occurred in 1787–1788. Lin, who was an immigrant from Zhangzhou, had come to Taiwan with his father in the 1770s and he was involved in the secret Heaven and Earth Society whose origins are not clear. There was initial success in pushing government forces out of Lins home base in Changhua, by this point, the fighting was drawing in Zhangzhou people beyond just the society members, and activating the old feuds, this brought out Quanzhou networks on behalf of the government. Though they never again were serious to push out the government or encompass the whole island, feuds went on sporadically for most of the 19th century, there were more than a hundred rebellions during the early Qing. The frequency of rebellions and civil strife in Qing Taiwan is evoked by the saying every three years an uprising, every five years a rebellion. Some British and Americans advocated the annexation of Taiwan, in 1841 during the First Opium War in the Battle of Keelung the British attempted to attack in failed efforts three times against Keelung on the northeast coast of Taiwan under Qing rule. The ventures to seize Daan and Keelung by the British failed, the successful defense was directed by Yao Ying who led the Chinese naval forces on Taiwan. 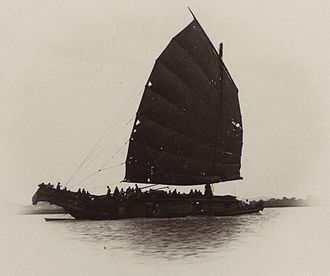 On Taiwan some British were taken as prisoners by the taotai Yao Ying and European crew members of the Nerbudda, a British ship, were captured on Taiwan after being abandoned by their British officers and were executed by local Qing officials. Portuguese, Indian and European crew members of the Ann, another British ship, were shipwrecked in Tamsuis vicinity in March 1842, captured, at Tainan 197 of the Nerbudda and Anns crew were killed and due to causes related to imprisonment 87 others died. The East Indies or Indies are the lands of South and Southeast Asia. In a more restricted sense, the Indies can be used to refer to the islands of Southeast Asia, the name Indies is derived from the river Indus and is used to connote parts of Asia that came under Indian cultural influence. The East Indies may include the former French-held Indochina, former British territories Brunei and Singapore and it does not, include the former Dutch New Guinea western New Guinea, which is geographically considered to be part of Melanesia. In colonial times they were just natives, the peoples of the East Indies comprise a wide variety of cultural diversity, and the inhabitants do not consider themselves as belonging to a single ethnic group. The major languages in this area draw from a variety of language families, and should not be confused with the term Indic. The extensive East Indies are subdivided into two sections, archaically called Hither India and Further India, the first is the former British India, the second is Southeast Asia. The short-lived Republic of Formosa resistance movement ended to no avail when it was suppressed by Japanese troops. The fall of Tainan ended organized resistance to Japanese occupation, the annexation of Taiwan into the Japanese Empire can be viewed as Japans first steps in implementing their Southern Expansion Doctrine of the late 19th century. 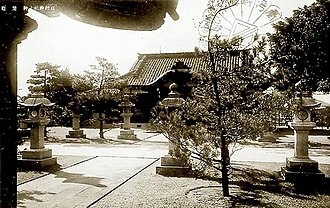 Taiwan was Japans first overseas colony, Japanese intentions were to turn the island into a showpiece model colony. As a result, much effort was made to improve the economy and public works. These efforts served to support the necessities of the war machine of Japanese military aggression in the Asia-Pacific, on 17 March 1945, the Imperial Diet in Tokyo passed a reform bill to grant Formosan inhabitants the right to vote representatives into the House of Representatives. In other words, Formosans were granted rights in the Empire of Japan. Japan formally renounced rights to Taiwan in April 1952, Japan had sought to expand its imperial control over Taiwan since 1592, when Toyotomi Hideyoshi undertook a policy of overseas expansion and extending Japanese influence southward. Several attempts to invade Taiwan were unsuccessful, mainly due to disease, in 1609, the Tokugawa Shogunate sent Harunobu Arima on an exploratory mission of the island. In 1616, Murayama Toan led an invasion of the island. In November 1871,69 people on board a vessel from the Kingdom of Ryukyu were forced to land near the tip of Taiwan by strong winds. They had a conflict with local Paiwan aborigines and many were killed, in October 1872, Japan sought compensation from the Qing dynasty of China, claiming the Kingdom of Ryukyu was part of Japan. The Japanese refused to leave and asked if the Chinese government would punish those barbarians in Taiwan, the Qing authorities explained that there were two kinds of aborigines on Taiwan, those directly governed by the Qing, and those unnaturalized raw barbarians. Beyond the reach of Chinese culture, thus could not be directly regulated. They indirectly hinted that foreigners traveling in areas settled by indigenous people must exercise caution. The Qing pointed to similar cases all over the world where a population within a national boundary was not under the influence of the dominant culture of that country. 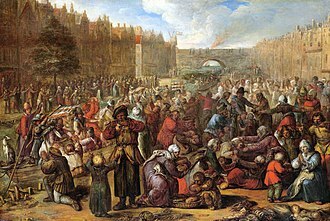 The Eighty Years War or Dutch War of Independence was a revolt of the Seventeen Provinces against the political and religious hegemony of Philip II of Spain, the sovereign of the Habsburg Netherlands. After the initial stages, Philip II deployed his armies and regained control over most of the rebelling provinces, under the leadership of the exiled William the Silent, the northern provinces continued their resistance. 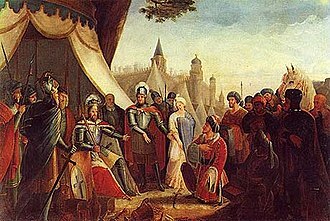 They eventually were able to oust the Habsburg armies, and in 1581 they established the Republic of the Seven United Netherlands, after a 12-year truce, hostilities broke out again around 1619 which can be said to coincide with the Thirty Years War. An end was reached in 1648 with the Peace of Münster, in the decades preceding the war, the Dutch became increasingly discontented with Habsburg rule. A major cause of discontent was heavy taxation imposed on the population, while support. At that time, the Seventeen Provinces were known in the empire as De landen van herwaarts over, the presence of Spanish troops, under the command of the Duke of Alba, brought in to oversee order, further amplified this unrest. Spain attempted a policy of religious uniformity for the Catholic Church within its domains. The Reformation meanwhile produced a number of Protestant denominations, which gained followers in the Seventeen Provinces and these included the Lutheran movement of Martin Luther, the Anabaptist movement of the Dutch reformer Menno Simons, and the Reformed teachings of John Calvin. 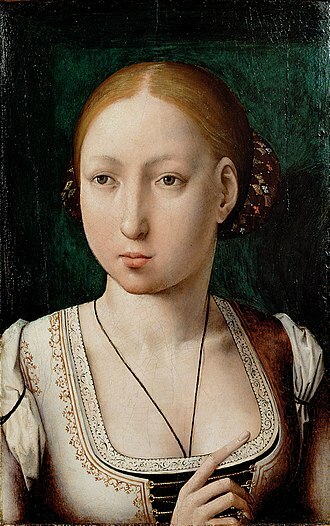 This growth lead to the 1566 Beeldenstorm, the Iconoclastic Fury which saw many churches in northern Europe stripped of their Catholic statuary, in October 1555, Emperor Charles V of the Holy Roman Empire began the gradual abdication of his several crowns. The balance of power was heavily weighted toward the local and regional governments, Philip did not govern in person but appointed Emmanuel Philibert, Duke of Savoy as governor-general to lead the central government. When Philip left for Spain in 1559 political tension was increased by religious policies, not having the liberal-mindedness of his father Charles V, Philip was a fervent enemy of the Protestant movements of Martin Luther, John Calvin, and the Anabaptists. Towards the end of Charles reign enforcement had become lax. Philip, insisted on rigorous enforcement, which caused widespread unrest, the new hierarchy was to be headed by Granvelle as archbishop of the new archdiocese of Mechelen. The reform was unpopular with the old church hierarchy, as the new dioceses were to be financed by the transfer of a number of rich abbeys. Granvelle became the focus of the opposition against the new governmental structures, after the recall of Granvelle, Orange persuaded Margaret and the Council to ask for a moderation of the placards against heresy. Philip delayed his response, and in this interval the opposition to his religious policies gained more widespread support, Philip finally rejected the request for moderation in his Letters from the Segovia Woods of October 1565. This Compromise of Nobles was supported by about 400 nobles, both Catholic and Protestant, and was presented to Margaret on 5 April 1566, impressed by the massive support for the compromise, she suspended the placards, awaiting Philips final ruling. Taiwan after World War II refers to the history of the island of Taiwan under the rule of the government of the Republic of China from 25 October 1945 to the present. The Second World Wars hostilities came to a close on 2 September 1945, with the defeat of the Empire of Japan, after the establishment of the provincial executive office, Chen Yi was appointed Chief Executive. 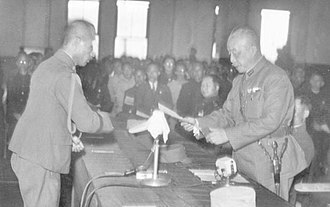 Chen proclaimed 25 October to be Retrocession Day, because Japan had not formally relinquished the sovereignty of Taiwan at that time, Allies of World War II did not recognize the unilateral annexation of Taiwan by the Republic of China. Chen Yis administration was marred by corruption, as well as a lack of discipline in the police assigned to occupation duties. With the rampant corruption in his administration, Chen Yi began to monopolize power, in addition to this, the islands post-war economy was failing and headed into a recession, causing people on the island to endure economic hardship. The building tensions erupted in 1947, when the arrest of a cigarette vendor by government agents led to the death of a bystander. Several weeks later, government troops were sent to Taiwan from the mainland to handle the crisis, after the February 28 Incident, the Kuomintang-led ROC government reorganized the local government, abolishing the Chief Executives Office, while establishing a new provincial government. Wey was succeeded as governor by Chen Cheng in 1949, in 1949, the Republic of China Armed Forces and the Kuomintang suffered a major defeat in the Chinese Civil War, forcing the Government of the Republic of China to relocate to Taiwan. 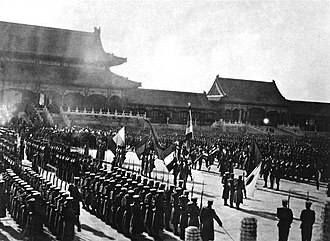 This allowed the Communist Party of China to declare the establishment of a new Chinese state, all of this changed rapidly when the PRC intervened in the Korean War, which ruined any chance of normalizing relations with Washington for years. With mainland China now an enemy of the US, the latter extended a cautious olive branch to Taipei under the adage of the enemy of my enemy is my friend. The victorious Battle of Guningtou by the ROC forces against the communist forces helped to boost morale in the ROC Army, the United States Seventh Fleet started to patrol the Taiwan Straits. 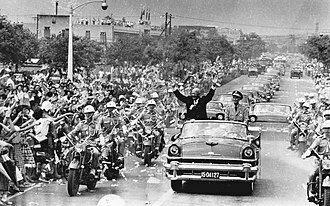 By the 1950s, Sino-American Mutual Defense Treaty was signed and US provided Military Assistance, the US Army maintained a garrison force in Taiwan until its withdrawal in 1979. The Sino-American Mutual Defense Treaty was replaced by Taiwan Relations Act after 1979, up and until 1958, small-scale military campaigns between the ROC forces and PLA were carried out across the strait, which lasted until the Second Strait Crisis. From that point on, both sides of the strait have ceased all hostilities against each other. The government under the Kuomintang, through its enforcement of law, kept a powerful hold on the state. Because the Republic of China was under authoritarian rule, any perceived opposition to the government was considered illegal, Chiang for his part never fully trusted US intentions and was wary of excessively pro-American politicians. Despite his advancing age and questionable mental state, Chiang continued to hold onto power into the 1970s, the Republic of China entered into the development phase of Constitutional Democracy with the promulgation of the Constitution of the Republic of China in 1947. The recordkeeping and development of the economic history of Taiwan started in the Age of Discovery. In the 17th century, the Europeans realized that Taiwan is located on the cusp between the Far East and Southeast Asia. Two main European empires that competed to colonize it were the Dutch, Taiwan became an intermediate destination for trade between Western European empires and East Asia states. The history of Taiwan as a colony of the Dutch Empire, Kingdom of Tungning, Qing China, in the 1950s, the Republic of China government, retreated to Taiwan after losing the Chinese Civil War, carried out land reform policies such as the 375 Rent Reduction. In the 1960s, the economy was replaced with light industry as small. From 1966 to 1980, Taiwans economy was stabilized as the Ten Major Construction Projects laid a foundation in further economic developments. 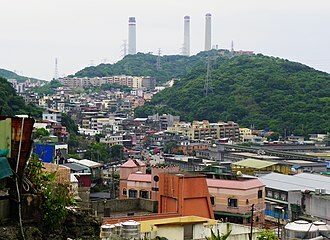 After the 1980s, the role of government in the economy gradually lessened as many government-owned corporations were privatized, according to archaeological evidences, Taiwan has been inhabited by human since the late Upper Paleolithic. One of the first civilizations developed was the Changpin culture in southern Taiwan, many archaeological sites of Neolithic civilizations were found in the Taipei basin in northern Taiwan. The economic activities during this period, which cannot be described with detail as there was no language, were fishing, gathering. About 2,000 years ago, northern Taiwan entered the Bronze Age, iron metallurgy and advanced agricultural techniques strengthened economic activities. The Shihsanhang culture rose during this period and had weaving technology and it did not end until the arrival of Han Chinese about 1,000 years ago. Most scholars believe that the Shihsanhang culture represented the activities of the Taiwanese Plain Aborigines, although there is no evidence to support this, it is generally recognized that the Taiwanese aboriginal tribes economically relied on fishing and pursued slash-and-burn agriculture. In the early 17th century, the Dutch East India Company originally only traded along the Pescadores, the Ming Dynasty claimed the archipelago to be part of its territory and drove out the Dutch. Anping District is a district of Tainan on Taiwan. In March 2012, it was named one of the Top 10 Small Tourist Towns by the Tourism Bureau of Taiwan. 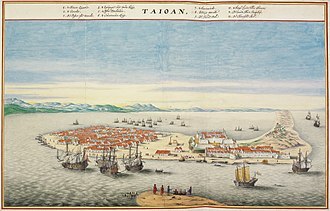 The older place name of Tayouan derives from the ethnonym of a nearby Taiwanese aboriginal tribe, in his translations of Dutch records, missionary William Campbell used the variant Tayouan and wrote that Taoan and Taiwan occur. As Dutch spelling varied greatly at the time, other variants may be seen, the name was transliterated into Chinese characters variously as 臺窩灣, 大灣, 臺員, 大員, 大圓 and 梯窝灣. After the Dutch were ousted c. 1661 by Koxinga, Han immigrants renamed the area Anping after the Anping Bridge in Quanzhou, soon after Qing rule was established in 1683, the name Taiwan was officially used to refer to the whole island with the establishment of Taiwan Prefecture. 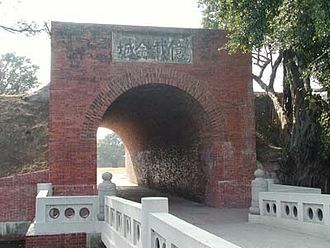 The history of Anping dates back to the 17th century, when the Dutch East India Company occupied a high sandy down called Tayouan, the Dutch moved their headquarters to Tayouan after leaving the Pescadores in 1624. The prehistory of Taiwan, ending with the arrival of the Dutch East India Company in 1624, is known from archaeological finds throughout the island. 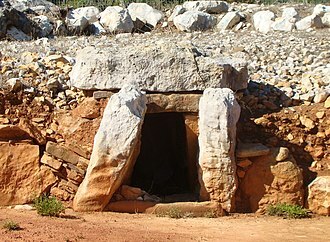 The earliest evidence of habitation dates back 20,000 to 30,000 years. Around 5,000 years ago farmers from the southeast Chinese coast settled on the island and these people are believed to have been speakers of Austronesian languages, which dispersed from Taiwan across the islands of the Pacific and Indian Oceans. The current Taiwanese aborigines are believed to be their descendants, the island of Taiwan was formed approximately 4 to 5 million years ago on a complex convergent boundary between the continental Eurasian Plate and the oceanic Philippine Sea Plate. The boundary continues southwards in the Luzon Volcanic Arc, a chain of islands between Taiwan and the Philippine island of Luzon including Green Island and Orchid Island, from the northern part of the island the eastward continuation of the boundary is marked by the Ryukyu chain of volcanic islands. The island is separated from the coast of Fujian to the west by the Taiwan Strait, the most significant islands in the Strait are the Penghu islands 45 km from the southwest coast of Taiwan and 140 km from the mainland. Part of the shelf, the Strait is no more than 100 m deep. Taiwan is a fault block, with rugged longitudinal mountain ranges making up most of the eastern two-thirds of the island. They include more than two hundred peaks with elevations of over 3,000 m, the western side of the island slopes down to fertile coastal plains. The island straddles the Tropic of Cancer, and has a subtropical climate. The original vegetation ranged from tropical rainforest in the lowlands through temperate forests, boreal forest, during the Late Pleistocene glaciation, sea levels in the area were about 140 m lower than in the present day. As a result, the floor of the Taiwan Strait was exposed as a land bridge that was crossed by mainland fauna until the beginning of the Holocene 10,000 years ago. 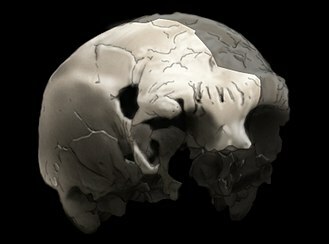 In 1972, fragmentary fossils of modern humans were found at Chouqu and Gangzilin, in Zuozhen District, Tainan. Replica of an East Indiaman of the Dutch East India Company/United East Indies Company (VOC). Wall of Fort Zeelandia, Anping District, Tainan City. 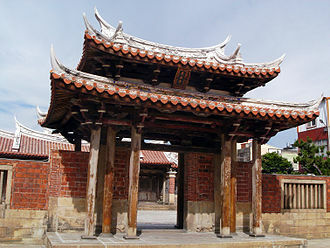 Established in 1624, Tainan is the oldest urban area on the island of Taiwan. Bird's eye view of Fort Zeelandia in Dutch Formosa in the 17th-century. It was in the Dutch rule period of Taiwan that Dutch East India Company (VOC) began to encourage large-scale mainland Chinese immigration. Keelung City Hall in Zhongzheng District. 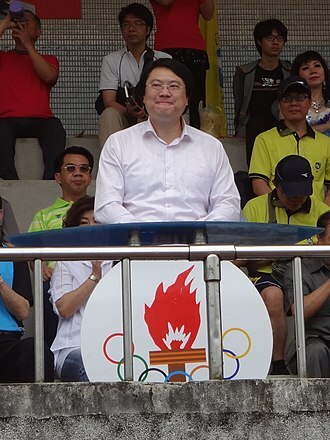 Lin Yu-chang, the incumbent Mayor of Keelung City. 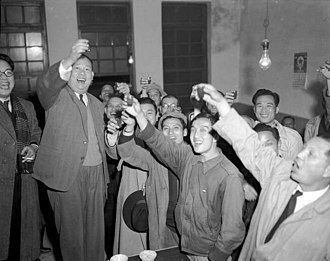 Non-Kuomintang Taiwanese politician Wu San-lien (2L) celebrated his landslide victory (65.5%) in the first-time election for mayor of Taipei in January 1951 with his supporters. Flight CAL581, first direct TPE–PEK flight, also first direct flight between Mainland China and Taiwan, 29 January 2005. Container depot and docks, Port of Kaohsiung. 1630: Dutch siege of Olinda, located in the Brazilian captaincy of Pernambuco, the largest and richest sugar-producing area in the world. Acclamation of John IV as King of Portugal, painting by Veloso Salgado in the Military Museum, Lisbon. Image of Calicut, India from Georg Braun and Frans Hogenberg's atlas Civitates orbis terrarum, 1572. Approximate location of the Kingdom of Middag in orange; Dutch and Spanish territory in magenta and green.